The Decadents didn’t do Christmas. In fact, Christmas is pretty much the antithesis of everything the movement stood for. Nevertheless, I feel under a certain amount of pressure to acknowledge the season in some way or another, so I thought I would hark back to that terribly nineteenth-century Christmas tradition – the ghost story. I therefore bring you my top ten list of supernatural short fiction to come from the Decadent movement, in no particular order, with links to the full text where possible. Arthur Machen has been pretty much neglected in recent years, which is a great pity as he really was one of the best occult writers of his generation. The Great God Pan is a tale which is disturbing precisely because nothing is ever fully revealed – and as all the best horror writers know, the imagination can conjure up things that are far worse than anything put down in print. Pagan religions appear quite often in Decadent art and literature, and Pan is especially popular, probably because of his connections with art and sexuality. Here he is shown as a demonic entity who terrorizes Victorian London through the means of a mysterious young woman born of a scientific experiment gone horribly wrong. A classic femme fatale story about two men who fall prey to a seductive sorceress who dwells in a mysterious forest. It is a tale of sensuality triumphing over spirituality, of surreal dreams, and deadly beauty. There is also a strong subtext of venereal disease. A gruesome little tale about the dangers of repressing sexuality. A sensual young girl is taught to feel shame for her desires, and direct her attention towards religion instead. Her sexuality takes on an unhealthy form, and she attracts the attention of a demonic lover, Pehor, who satisfies her longings, and eventually destroys her. I’m afraid I wasn’t able to find an online version, but it’s well worth tracking down. This is a story of a village that lives in fear of the unknown things that live in the forest across the brook. It is said that werewolves dwell there, and Satanic rites are practiced. But one boy from the village, Gabriel, who is different from the others, is seduced by this mysterious unknown world, and is gradually seduced away from the world he once belonged to. This is a gorgeous story, full of mysticism and seduction. Stenbock creates a truly Decadent fairy tale. The story that inspired Freud’s famous essay on the uncanny, The Sandman is a classic tale of obsession and self-perpetuating doom. It is the story of a young student persecuted by the childhood memory of the mysterious Sandman whom he believes killed his father. He is gradually driven from his senses as he meets – or thinks he meets – the sandman again in various guises in his adult life. He also finds the time to fall in love with a beautiful automaton, Olympia, along the way. For an added Christmas touch, think of it as the creepy version of The Nutcracker. Written in the form of a diary, a man records his persecution at the hands of a mysterious, demonic entity. 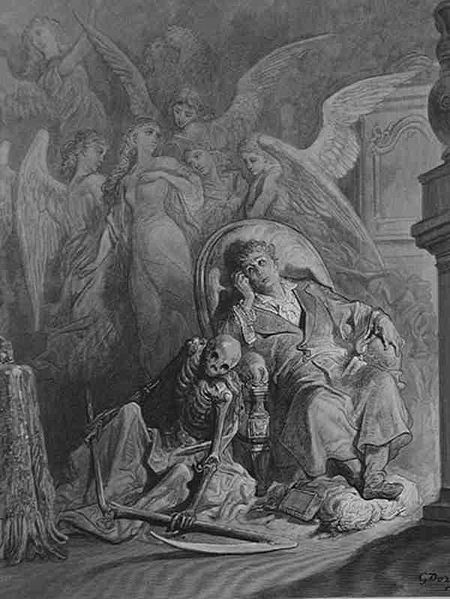 The Decadent movement boasts a wealth of literature that leaves the reader unsure as to whether they are being told of genuine tale of the supernatural, or an account of a diseased mind. The uncertainty makes it that much more disturbing. A classic ‘mad scientist’ tale about a young man sent to collect from an old colleague of his boss. An old colleague with a nasty reputation for conducting grotesque, satanic experiments on himself that have left him half man, half bloodthirsty beast. It’s all ridiculously camp, but then some of the best Decadent literature is. I’m cheating a little here, as this is part of a longer work by France called The Well of St Clare, but I think it works pretty well as a stand-alone work. It’s another tale of the conflict between the profane and the sacred. A religious man discovers the tomb of ‘Saint Satyr’, really a pagan god, and he experiences visions of sexual orgies and sickening rites, before he is finally destroyed. Another great Decadent piece of literature dealing with sexual corruption, physical and moral decay, and the instability and hypocrisy of conventional morality. I recently discussed this tale in my review of Lee’s Hauntings, but I thought it was well worth another mention. Set in Venice, it’s the tale of an ailing composer slowly driven out of his mind by what he believes to be the spirit of a famous male singer, whose voice had the power to kill. The intoxicating, hedonistic Italian setting adds to the sense of claustrophobia and corruption. Robert Murray Gilchrist’s “The Crimson Weaver” was the only story he published in the notorious “Yellow Book,” and it is the subject of recent criticism in France by Evanghelia Stead, Nathalie Prince and Catherine Rancy. It is notable for its use of bird symbolism and references to obscure Renaissance drama. Gilchrist was a contradictory fellow and little is known about his life. We do know that he also published decadent stories in the National Observer, edited by “anti-decadent” poet W.E. Henley. Unlike most decadents, he was a country boy who seldom visited London. Forgotten for decades, his works seems to be undergoing a revival. I hope so – I’ve hardly been able to find anything out about him, and I loved “The Crimson Weaver”. I’ll have to look out for the Observer stories. Thanks for posting this!